It was the Cardinal's first team win since Feb 2010. Stanford had the #1, #3 and #4 finishers individually, perhaps the best top 3 finishes by any team in years. Closest to that were #4, #5 and #6 finishes by Stanford in the May 2010 regional at Notre Dame. Stanford led all 3 rounds and won by 16 shots, a larger margin than any in recent memory. Stanford had 5 rounds in the 60s on a very tough course, next best team had 2 rounds in the 60s. Stanford had the day's low individual round on two of the three days, and was 1 stroke behind on the other day. 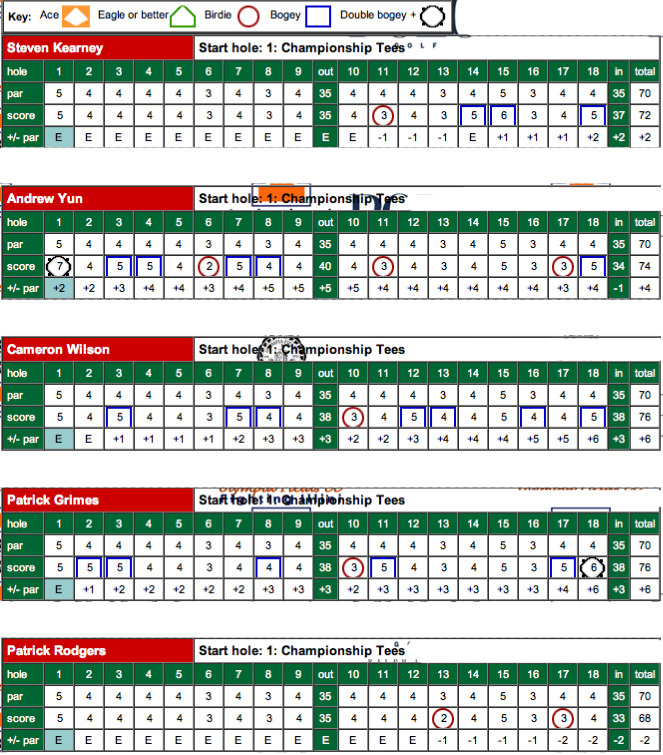 Patrick Rodgers' win in his first event was the first such win by a freshman since Tiger Woods in 1995. Patrick Rodgers was named national player of the week by Golf Week and Stanford athlete of the week for all sports, the latter a first for a golfer since Sihwan Kim was honored June 2008. The lineup included two freshman, one sophomore and two juniors. Stanford was playing without 2-time All-American David Chung. This is only one event and a long road lies ahead to where this team will hope to end up but it will surely be fun to watch this year's crop of players develop. The 2011-12 tournament season started at the famed North Course at Olympia Fields Country Club outside Chicago and Stanford would dominate the strong field with a 16 stroke win. Olympia Fields North hosted the 2003 US Open plus three other majors and the event features a strong field --- the Cardinal have been picked at #20 in pre-season rankings by Golf Week. Hosted by Illinois, the field is very strong including #1 Oklahoma St., #4 Alabama, #6 Florida, defending champ #8 Augusta St., #12 Duke, #13 Texas and #23 Ohio St. in the 15-team field. Live scoring is provided by Golf Stat. 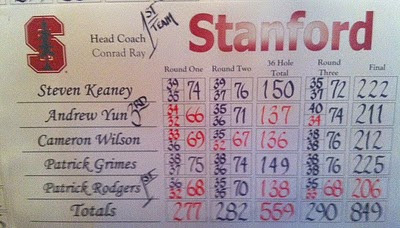 Stanford fielded a young team led by returning junior 1st team All-American Andrew Yun, junior Steven Kearney, sophomore Cameron Wilson and two freshman, high-touted Walker Cupper Patrick Rodgers and Patrick Grimes who hails from Atherton next door to Stanford. All-American senior David Chung did not qualify for this event but no doubt will be an added force as the season progresses. Results are posted in reverse order, most recent at the top. FINAL ROUND RESULTS - Playing in rainy final round conditions, the Cardinal expanded their 2nd round lead from 11 shots to a final 16-stroke margin to dominate a field that included many of the nation's top players. The team win was Stanford's first since a Feb 2010 win in Hawaii at the UH-Hilo Invitational. The team was led by freshman Patrick Rodgers who posted a 3-shot individual win in his first collegiate event firing a 4-under total of 206 on rounds of 68-70-68. 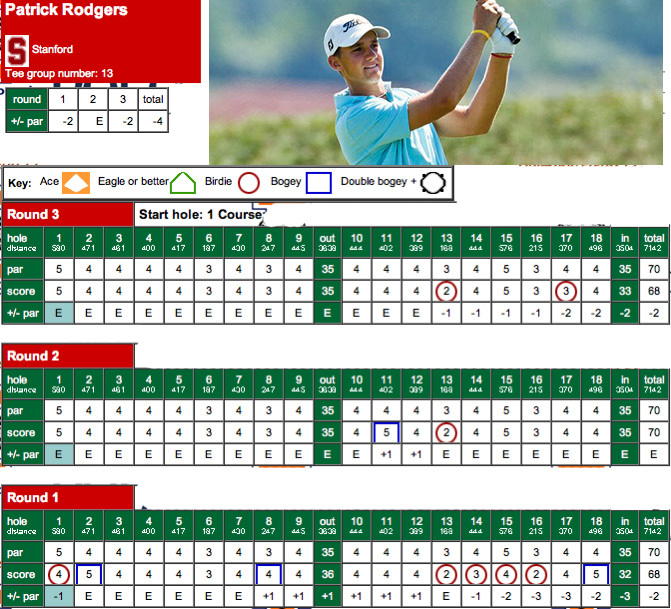 Patrick's final round gem was the low round of the day and featured a bogey-free scorecard with two birdies on the back nine. The individual win was the first by a Cardinal since Andrew Yun's win at the Prestige at PGA West in October of 2010. It also was the first time a Stanford freshman won in his first tournament since Tiger Woods did so in 1995. Andrew Yun finished 3rd individually (his 9th top 5 career finish) with a 211 total and rounds of 66-71-74 while 2nd round leader Cameron Wilson finished 4th individually (his best career finish topping a 5th place finish last season) with a 212 total on rounds of 69-67-76. Steven Kearney finished with a 222 total on rounds of 74-76-72 and freshman Patrick Grimes had a 225 total and rounds of 75-74-76. 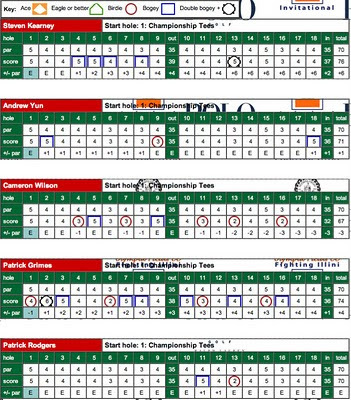 The 1-3-4 finish was easily the best individual result for 3 players in recent memory, the closest to this being the 4-5-6 finish in the 2010 regional at Notre Dame. 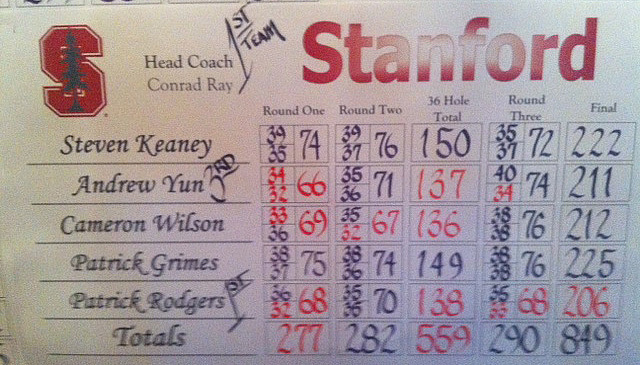 Here's a Golf Week story about the Stanford win || Here's a GoStanford.com story about the win. In the latter story Coach Conrad Ray said "we could sense that Patrick was motivated to play well and feeling good about his game. He's really excited and he's looking forward to getting to school and settling down a bit after a busy summer." 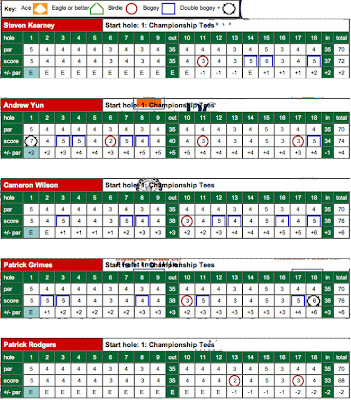 Images below include the top 5 team and individual scores, a photo of the winning scoresheet, and scorecards of the 3rd round and of Patrick Rodgers' 3 rounds. As with all images click on image to enlarge. ROUND 2 RESULTS - The Cardinal extended its lead to 11 shots over #1 ranked Oklahoma St. after the day's low of 282 total. Scores were higher as the players faced difficult pin positions and windy weather. Stanford has the only 3 individuals under par, led by Cameron Wilson at 4-under (69-67 136). Cameron is followed by Andrew Yun at 137 (66-71), Patrick Rodgers at 138 (68-70), Patrick Grimes at 149 (75-74) and Steven Kearney 150 (74-76). 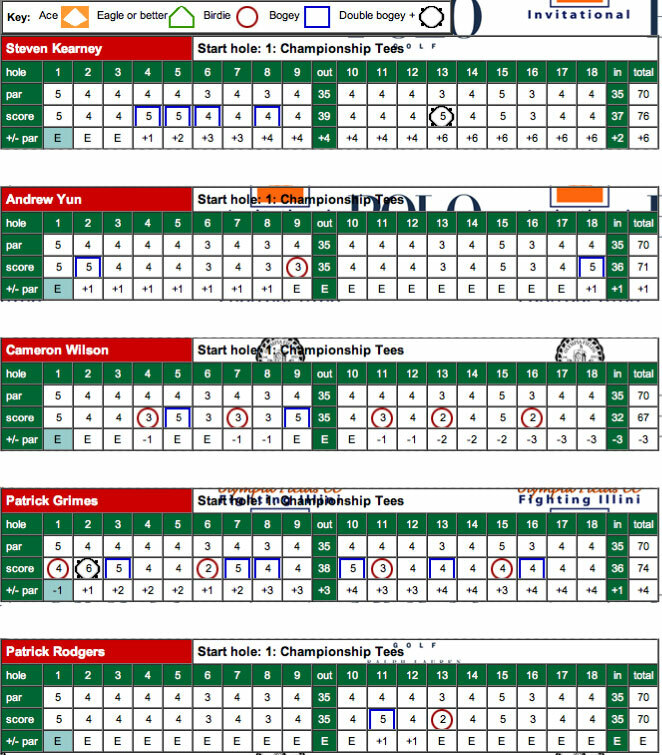 Cameron's great round featured 5 birdies including 3 on the back nine while Rodgers' solid round included only 1 bogey and 1 birdie. 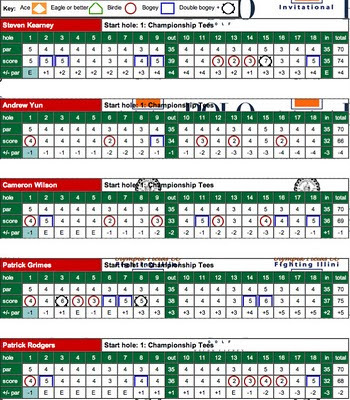 Cameron's birdied the par-4 11th a day after making bogey there and he sunk a 45-foot putt on the 16th hole for another birdie en route to the day's 2nd low round. "Cameron's been hitting it pretty well", said Coach Conrad Ray. "Yun and Rodgers" played solid. Kearney and Grimes are battling,Grimes made a couple of big par putts on 17 and 18 to help our fourth score." 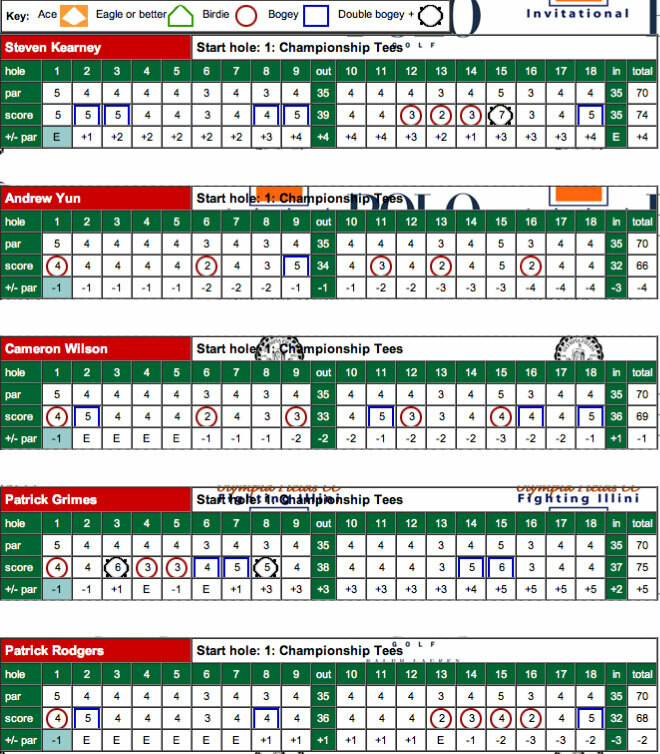 See the scorecards below -- click to enlarge. ROUND 1 RESULTS - Stanford sits in first place with a 5-stroke lead over Oklahoma St. after a solid first round 277, 3-under the par 70. Andrew Yun is in 1st individually with a 66 followed by Patrick Rodgers 68, Cameron Wilson 69, Steven Kearney 74 and Patrick Grimes 75. 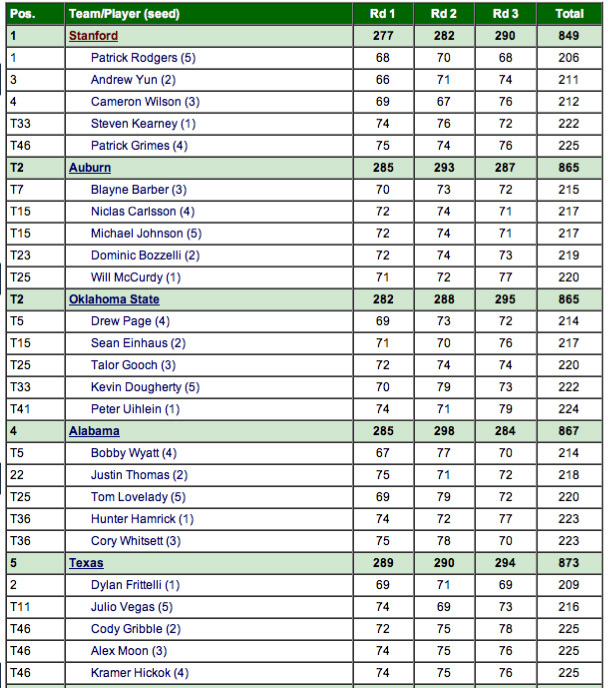 The scorecards for round one are shown below. 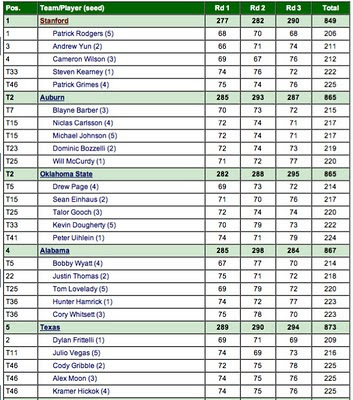 Andrew's sterling round featured five birdies and only 1 bogie on the tough layout, Cameron's round also included 5 birdies while Rodgers started his collegiate career with a strong round highlighted by four straight birdies leading to his back nine 32. Head Coach Conrad Ray said "we played well today, stayed on the fairways and had some good looks. All our guys played great. We had high expectations coming in and we need to continue to play at this level, there are a lot of really good teams behind us."